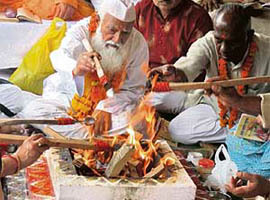 Dr G.D. Agarwal (76), a noted teacher and environmentalist, on the occasion of “Ganga Dusshera” today, started his indefinite fast at the Manikarnika Ghat on the banks of the Bhagirathi, near Uttarkashi town, in protest against the construction of a large number of hydro-electric projects on the Ganga between Gangotri and Uttarkashi. A large number of his students, disciples, social activists and environmentalists, including Sunder Lal Bahuguna, M.C. Mehta, Rajinder Singh, former BJP ideologue K.N. Govindacharya and Dwarika Peeth and Badridham Peeth Shankaracharya Swaroopanand Saraswati also observed a day’s token fast in support of the cause. Environmentalists and social activists organised similar dharnas at various places in the country, including New Delhi, Dehra Dun, Raipur, Dharamsala, Madhya Pradesh, Rajasthan and Bihar. A signature campaign to ‘Save Ganga’ was also launched on the occasion. “We will present the signatures from across the country to the Prime Minister,” announced Dr Ravi Chopra of the Peoples’ Science Institute (PSI), a Dehra Dun based voluntary group, who is the coordinator of the campaign. Dr Agarwal, a former professor of the Indian Institute of Technology (IIT), Kanpur, and first member secretary of the Central Pollution Control Board, said he found that in the past few years, the continuity, quantity, quality and regime of flow of this precious river were being disrupted for the generation of hydro-electricity. Long stretches of the river were already becoming dry downstream of Maneri in Uttarkashi and in the near future this might become the state of the entire river, he added. “As a serious student of environment science and as a faithful Hindu, this is hard for me to swallow. I strongly believe that at least the Bhagirathi upstream of Uttarkashi should be spared of any works that disturb its natural flow regime, ecology, purity or piety. After deep deliberations, I have decided to go on an indefinite fast to oppose the destruction of this ecological marvel and the epitome of Hindu cultural faith,” he added. Magsaysay award winner M.C. Mehta said they were not against developmental works but were demanding that out of the total 2,525 km of the Ganga, only 125 km stretch between Gangotri and Uttarkashi should be free of all sorts of projects. The national convener of the Rashtriya Swabhiman Andolan, N. Govindacharya, said Uttarakhand Chief Minister Khanduri had shown double standards by opposing the Tehri dam in the past and now after coming to power by laying the foundation of the Pala Maneri project two days ago near Uttarkashi. Agrawal’s move came in the wake of a series of protests by local people, who are on the verge of being uprooted at several places following the construction of these dams. The dams include Pala Maneri (480 MW), Maneri Bhali Phase-11 (304 MW), Lohari Nagpala (600 MW), Koteshwar (400 MW), Bhairon Ghati (381MW) and Jad Ganga (200 MW). A group of 20 women activists on Wednesday courted arrest after they showed black flags to Khanduri, who had gone to Uttarkashi to lay the foundation stone of the Pala Maneri hydel project. The BJP government of Major-Gen B.C. Khanduri finds itself in a piquant situation. While on one hand the Chief Minister claimed that he was opposed to bigger dams, on the other he had been talking of harnessing the 40,000 MW of hydro-power potential of the state. Interestingly, the move of Dr Agarwal would also put pressure on the VHP that would be meeting at Haridwar tomorrow to chalk out their next action on the Ram Mandir, the Ram Setu and the Ganga.